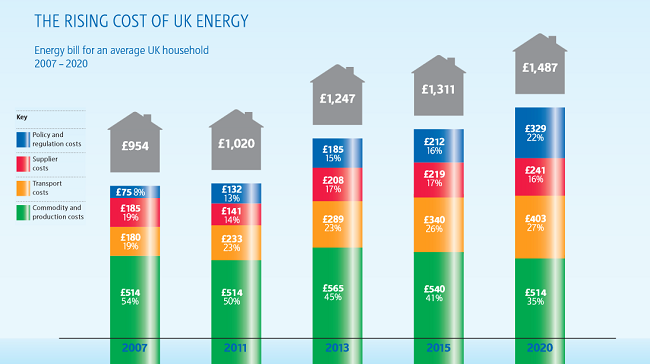 Analysis Almost all Britons know that their home energy bills have been climbing painfully in recent years, and many are realising that this process is now set to continue indefinitely. What's not clear is just why this is happening: some lay the blame on rising gas prices, others on profiteering energy firms. Meanwhile, apropos of nothing in particular, the government has just announced that it has asked the British people what they think about energy, and that they are "overwhelmingly committed to moving away from fossil fuels towards renewable forms of energy production". 'Gas prices' in green, corporate profiteering in red. Money being cranked up for green purposes, confusingly, is blue and yellow. That last bit is interesting, because just lately the big energy-supply companies have begun very cautiously to mutter quietly - but in public - to the effect that a lot of the price rises past and future are caused not by them gouging us for bigger profits, not by rising fuel prices, but by something the government is doing. In fact just this week the loudest muttering yet out of an energy company has been heard, as Big-Six supplier RWE npower has issued a report (pdf) into energy price rises in the UK. One of the most significant figures in it is the way that commodity and production costs - that is, the price of buying crude gas (along with some coal, and a little oil and uranium) and turning these things into household gas and electricity - have changed since 2007, and how they are set to change. These are the "gas prices" that we so often hear of as the reason why our bills keep going up. Care to guess how much "gas prices" have surged over the last six years, as the average household bill has climbed by roughly thirty per cent? They are up by just ten per cent. That's strange. And it gets stranger. RWE npower's analysts believe that the relatively small rises in commodity/production prices we've seen will probably go away again by 2020, so that their costs in this regard will return to the same level as they were in 2007. This will be due to gas fracking, more efficient powerplants and other factors. In the year 2020, then, "gas prices" will have gone up by zero per cent since 2007. What will have happened to bills? Will they have gone down again to reflect this, in npower's view? Certainly not. By that point, the company forecasts that our energy bills will have climbed even more. They will be up no less than fifty-six per cent on 2007 levels, on top of no increase at all in "gas prices". So what does npower CEO Paul Massarra have to say for himself? "For a long time, blame has shifted back and forth from energy suppliers to government, each pointing the finger at the other for rising costs," avers the energy kingpin. "This blame game hasn’t helped people - if anything, they don’t know who or what to believe. It’s led to confusion, mistrust, and misinformation, and that’s something we urgently need to address." Alright then, so what's the true story? "A recent npower survey showed that people believe supplier profits are typically about 40 per cent, and general perception is that bills are rising because of supplier-controlled costs. In fact, our profits are more like 5 per cent and the main factor behind rising costs is government policy and regulation to fund this country’s transition to a more efficient economy, with modern infrastructure and warm, insulated homes for all." OK, so Massarra is claiming that it's not surging profits for him that are going to see bills up by 50 per cent while gas prices (and coal, oil and uranium) remain stable. He says the soaring bills have been ordered by the government to fund "modern infrastructure" and "warm, insulated homes for all". It's pretty clear that with energy bills based on a given consumption figure up by half, people on low or even ordinary incomes are going to need insulated homes or they won't be warm at all. In fact they'll be freezing every winter, unable to afford to turn the heating on, and lots of them will get sick (and die, if they're old or weak enough). So the push for insulated homes is not a benefit here, it's a necessary damage-limitation measure to stop the government's main push for "modern infrastructure" from causing too much misery, disease and death. And anyway, the "warm, insulated homes" bit is only a small part of this. In 2020, Joe and Jemima Average's bills will be up by no less than £533. Just £84 of that rise will be for "improving customer energy efficiency" and "supporting vulnerable customers", according to npower's figures - those are the warm-insulated-homes bits. Massarra and his henchmen admit that they hope their profits will remain at 5 per cent of the swelling bills, accounting for another £27 of increase. The other £420+ will be down to government action under the heading of "modern infrastructure", they say - and it is this which causes the need for "warm, insulated homes" in the first place, and which will raise RWE npower's turnover so that its profits can climb too. The government's £420-odd in "modern infrastructure" stealth levies will go on the following headings in the npower report, which mean the following things*. "Carbon tax" and "supporting low carbon technologies"
These are the various government schemes such as the Renewables Obligation and Feed In Tariffs, which ensure that energy supplier companies like RWE npower must pay out huge sums over and above the price of any energy produced to windfarm operators and people who put solar panels on their roofs. This ensures that there will be windfarms and rooftop panels. There are also the costs of the EU Emissions Trading Scheme, intended to make some businesses use energy more efficiently - and which has the unintended effect of making it greener for you to travel by airline than by bus. This covers the extra costs arising from keeping gas and other thermal power stations around to provide backup for erratic supplies from windfarms and solar panels, even though the thermal plants must run less and get expensively thrashed on and off more often (this also generates extra wear and tear on the gas grid). An alternative method, already often used, is paying windfarms not to produce power when it gets too windy, thus giving the ordinary powerplant owner a chance to preserve his or her equipment. Britain’s networks are undergoing substantial investment to ensure they are fit for a low carbon future. New power stations need to be connected to the network with new lines, and new renewable energy technologies tend to be located in areas with little existing network infrastructure. Planning difficulties have meant a new emphasis on underground lines which can be up to ten times more expensive than traditional overhead lines. In other words, this bit is the cost of modifying the national grids to suit wind farms and solar panels.